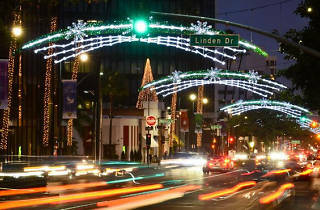 Photograph: Courtesy City of Beverly Hills Christmas lights in Los Angeles: Wilshire Boulevard in Beverly Hills. 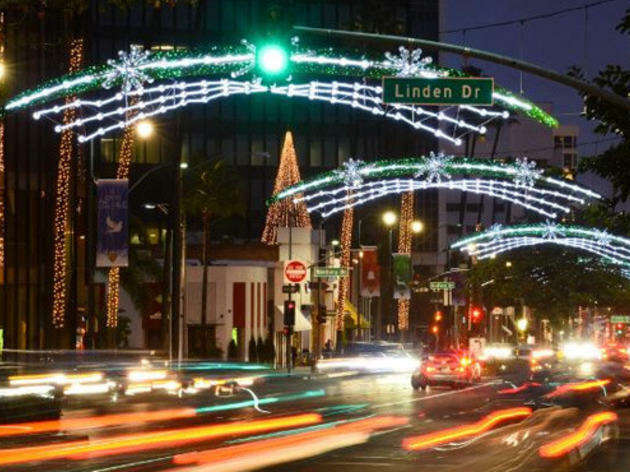 Christmas comes to Rodeo Drive in a stylish fashion that only Beverly Hills could pull off. The street will be bathed in twinkly lights—as will the Beverly Wilshire—and even a confetti “snow” shower. The kickoff ceremony takes place near Brighton Way, but you can see the lights anywhere along Rodeo Drive between Santa Monica and Wilshire Boulevards. On weekends throughout the holiday season, you can swing by the Paley Center to meet Santa or hop aboard a trolley tour with Mrs. Claus.